Fairfax is the name for Fostoria's Line 2375. It was produced from 1927 to 1944 and is the blank that was used for many of Fostoria's most popular etchings. 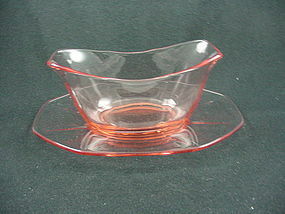 Offered here is the gravy boat & liner plate in pink in excellent condition. The gravy boat is approximately 5 1/2 inches long, the liner plate is 7 inches long. See my other listings for more in this pattern in assorted colors. 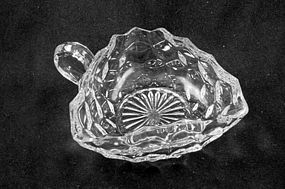 American is perhaps the most widely recognized pattern that Fostoria Glass Company produced. 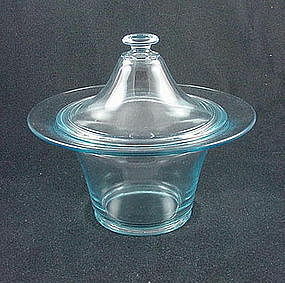 Offered here is the 4 1/2 inch triangular handled bowl or nappy (the English term for a small bowl) in perfect condition. See my other listings for more in this pattern. 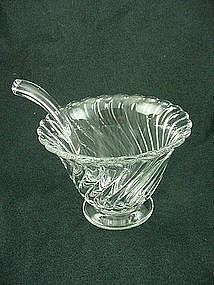 American is perhaps the most widely recognized pattern that Fostoria Glass Company produced. Offered here is the ice tub in perfect condition. See my other listings for more in this pattern. Fairfax is the name for Fostoria's Line 2375. It was produced from 1927 to 1944 and is the blank that was used for many of Fostoria's most popular etchings. 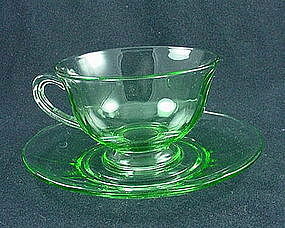 Offered here is the footed cup & saucer set in green. Perfect condition, I have 5 available. Price is per set. See my other listings for more in this pattern in assorted colors. 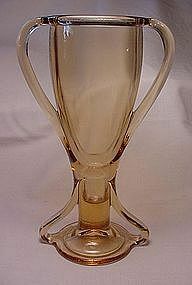 The Versailles pattern was produced by Fostoria Glass Company from 1928 to 1944. It's an elegant etching that's more lovely than pictures can capture. 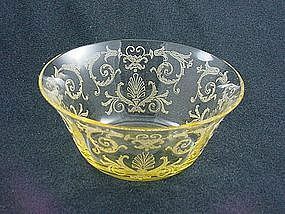 Offered here is the 4 1/2 inch finger bowl in yellow. This bowl is blown, not molded, and so it's very thin and graceful. Excellent condition, I have 4 available. Price is per bowl. From 1961 to 1965, Fostoria produced some very elegant occasional pieces that were modeled upon the crowns of Europe. 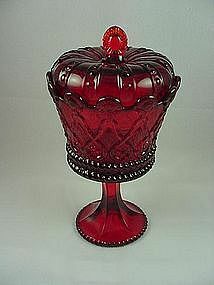 This 9 1/2 inch covered candy jar is the Hapsburg Crown pattern. It's shape #2750/386 in the original advertisements. The color is a rich ruby red. Perfect condition. Fostoria Glass Company made the 'Tut' vase in the mid 1920's when all things Egyptian were in style - along with the 'Art Deco' movement. This vase is 6 1/2 inches tall and in perfect condition. See my other listing for a black (called Ebony by Fostoria) Tut vase to compliment this one. 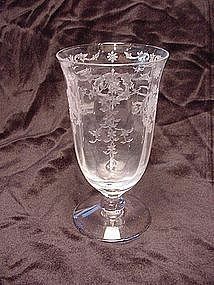 The Navarre pattern was one of Fostoria Glass Company's most popular etched patterns. Produced from 1936 until they closed in 1982, it continues to be in demand today. Pictured here is the juice tumbler. 4 5/8 inches high, the tumbler holds 5 oz. These are more beautiful than pictures can capture. I have 10 available, price is per tumbler. See my other listings for more stems in this pattern - including some of the rare cordials! Fairfax is the name for Fostoria's Line 2375. It was produced from 1927 to 1944 and is the blank that was used for many of Fostoria's most popular etchings. 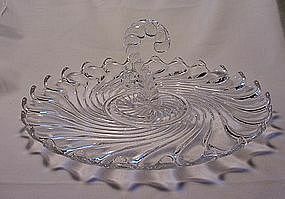 Offered here is the 11 inch center handled serving tray in Topaz. 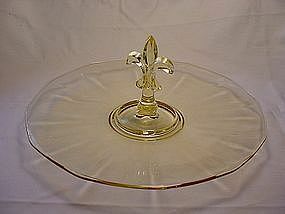 Excellent condition, note the beautiful Fleur-de-lis handle. See my other listings for more in this pattern in assorted colors. Pictured here is Fostoria's Colony pattern 11 1/2 inch center handled sandwich server in perfect condition. Note the intricate 'question mark' handle. The picture does not do this plate justice - the glass just sparkles on the table! I have other pieces available in this pattern. See my other listings or email for details. 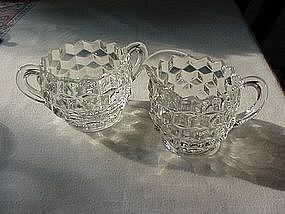 This Priscilla pattern sugar & creamer were made by the Fostoria Glass Company from 1925 to 1930. Both pieces are in perfect condition. The sugar bowl is the larger size - I have a smaller one also listed, as well as matching tumblers. See my other listings or email for details. Fairfax is the name for Fostoria's Line 2375. It was produced from 1927 to 1944 and is the blank that was used for many of Fostoria's most popular etchings. 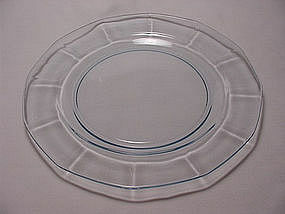 Offered here is the 7 1/2 inch salad plate in Azure Blue - a soft blue color Fostoria produced. I have 8 available, price is per plate. See my other listings for more Fairfax or email for details. 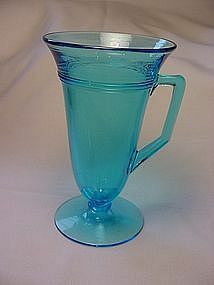 This Priscilla footed tumbler was made by Fostoria Glass Company between 1925 and 1928 - that's when they were producing the 'Electric' blue color of this tumbler. Approximately 6 inches tall and in perfect condition. Perfect for Irish Coffee or iced tea on the patio. See my other listings for matching plates and low handled cups to match. 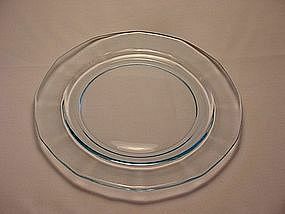 American is perhaps the most widely recognized pattern that Fostoria Glass Company produced. 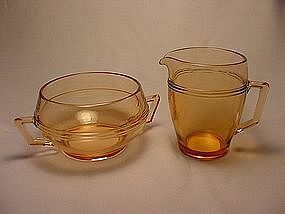 Offered here is the tea size sugar & creamer in perfect condition. The creamer holds about 3 oz to the bottom of the spout. See my other listings for more in this pattern. Fairfax is the name for Fostoria's Line 2375. It was produced from 1927 to 1944 and is the blank that was used for many of Fostoria's most popular etchings. 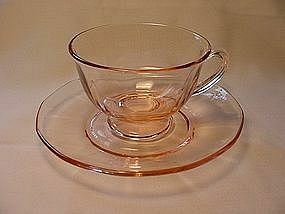 Offered here is the footed cup & saucer set in pink. Perfect condition, I have 5 available. Price is per set. See my other listings for more in this pattern in assorted colors.